Cephalopods possess a great variety of light-producing organs (photophores). Some are very small and complex like the drawing below of a section through a photophore of Abralia trigonura which is less than 0.2 mm in diameter and as complex as the eyes of some animals. Some other photophores are very large such the arm tip organs of Taningia which can be nearly 5 cm in length and 2-3 cm wide. Cephalopod photophores have a wide range in structure from a simple group of photogenic cells to organs with photogenic cells surrounded by reflectors, lenses, light guides, color filters and muscles. The latter complex photophores are often able to actively adjust the color, intensity and angular distribution of the light they produce. Photophores of most oceanic cephalopods have intrinsic luminescence with the light coming from their own specialized cells, the photocytes. Photophores of most neritic cephalopods, in contrast, have extrinsic luminescence with the light produced by bacteria that are cultured in specialized light organs of the host cephalopod. Figure. Longitudinal section through an integumental chromatophore of Abralia trigonura. Drawing with artificial colors modified from Young and Arnold (1982). 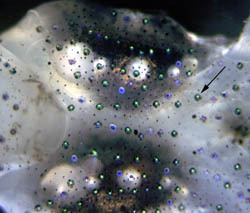 Chromatophores - Pigment cells that absorb light leaving the photophore in undesirable directions or that shield the reflectors of the photophore, when the photophore is not active, from reflecting external light that could reveal the presence of the cephalopod. 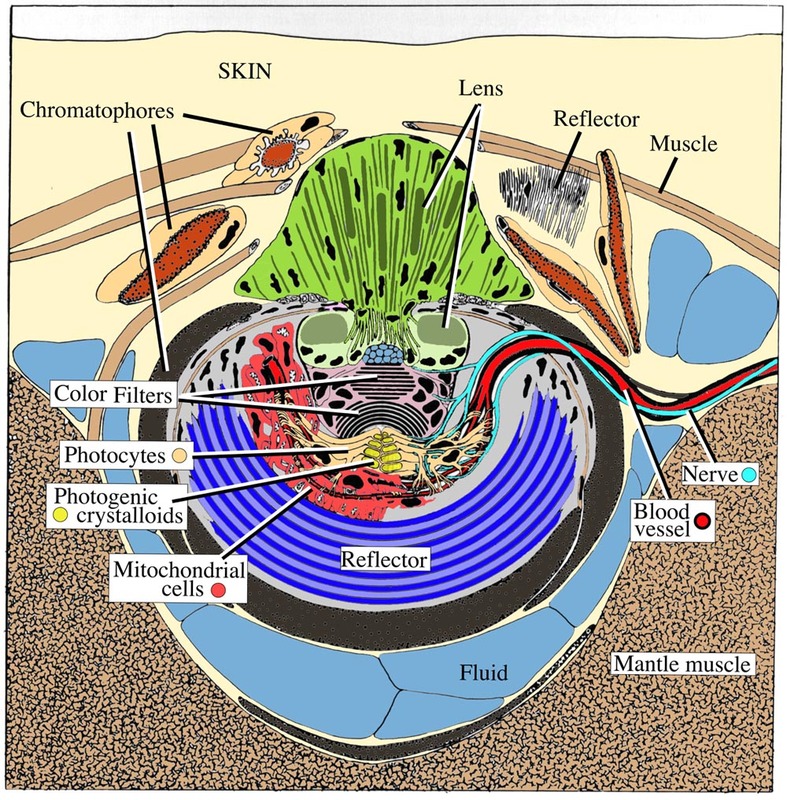 Color filters - Structures within a photophore that restrict the color of the light emitted by the photocytes. Filters can either rely on selective absorption of light (pigment filters) or selective transmission/reflection of light (iridophores). Lenses - A variety of structures that apparently affect the directionality of light are called "lenses." Some of these appear to act like typical optical lenses but the mode of action of others (like those in the illustration to the right) are uncertain. Light guides - Structures that control the direction of emitted light through the use of "light pipes" that rely on total internal reflection. These function in the same manner as fiber-obtic light guides. Photocytes - Cells that produce light (i.e., the bioluminescence). Photogenic crystalloids - Some photocytes have crystalline-like inclusions that are thought to be the actual site within the cell where light is produced. Reflectors - The primary reflectors are structures at the back of a photophore that reflect light toward the exterior. These may be broad-band reflectors that reflect all light or narrow-band reflectors that selectively reflect specific colors. Light not reflected by the latter structure passes through it and is absorbed by chromatophores that usually surround the reflector. Secondary reflectors can be found in various regions near the distal parts of the photophore. These generally have a role in controlling the directionality of the emitted light. Figure. Close-up photograph of the ventral surface of the head of a young (ca. 18 mm ML) Abralia trigonura showing a photophore (arrow or any of the green photophores) of the type illustrated above. Note that there is a variety of other types of photophores visible in this photograph. Young, R. E. and J. M. Arnold. 1982. The functional morphology of a ventral photophore from the mesopelagic squid, Abralia trigonura. Malacologia, 23: 135-183. Page: Tree of Life Cephalopod Photophore Terminology Authored by Richard E. Young, Michael Vecchione, and Katharina M. Mangold (1922-2003). The TEXT of this page is licensed under the Creative Commons Attribution-NonCommercial License - Version 3.0. Note that images and other media featured on this page are each governed by their own license, and they may or may not be available for reuse. Click on an image or a media link to access the media data window, which provides the relevant licensing information. For the general terms and conditions of ToL material reuse and redistribution, please see the Tree of Life Copyright Policies.